On August 30, 2003 Charles Bronson died of pneumonia and went to Hell. Bronson entered the first level of Hell with a chip on his shoulder. He demanded to speak to the Devil himself about his stay. Upon entering the Devil’s chamber, he pulled out a .44 Magnum and blew his teeth out the back of his skull. He now rules Hell under his new name, Lucifer Bronson. His first assignment as King of Hell was to write the most evil music ever to be heard by human ears. He wrote countless hours of music and hid it in a secret dimension. In Saint Louis, Missouri, four guys were smoking a combination of marijuana and salvia. They uncovered Bronson’s sheet music and decided to document it for mankind. This music can only be recorded under the influence of black weed during Bronsonic rituals. 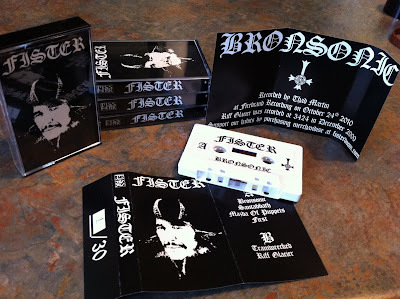 The only people on Earth that can understand the workings of Bronson’s sheet music are the Ambassadors of Hell, Fister. The band is selling these cassettes at their show Jan. 21st @ The Firebird in St. Louis, MO and are limited to only 30 copies. If you are not lucky enough to get to the show the band will sell the remaining copies at Pissfork.net. If you can't get a copy at the show or online, the band is making the album available as a free download right here on Heavy Planet. Doom on!